Vancouver police officers ticketed the same driver twice in six minutes for allegedly using a cellphone while driving. Officers said the same driver in the same vehicle was stopped by two members of their department Monday. Sgt. 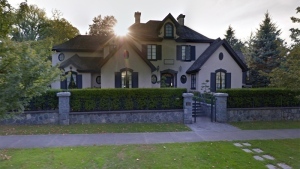 Jason Robillard said members of the Vancouver Police Department were stationed in an area of the city as part of a province-wide crackdown on distracted drivers in the month of March. Officers were stationed in one area, then about a block further down the street. The driver was pulled over and issued the violation ticket - which comes with a $368 fine - shortly before 10 a.m. The same driver was pulled over in the next block and given the same ticket. "I'm actually not surprised by this," Robillard said at a news conference the next day. "I think distracted driving is an issue here and I think it's not just the police that issue tickets, it's all of us that have a role to play to keep our streets safer." He urged the public to talk to the people they know who text and drive and ask them to put down their phones. "It's just not worth it. It's very dangerous behaviour," he said. On Tuesday, police posted on social media that officers were taking their enforcement efforts to Granville Street. Our officers are still set up on Granville Street watching for distracted drivers today. 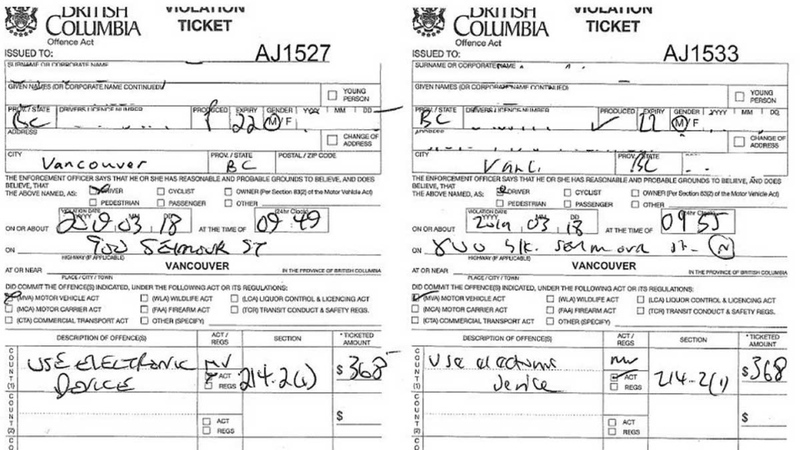 A pair of distracted driving tickets is shown in an image posted online by Vancouver police.